Organisers of D-Day 75 in Fareham are delighted to announce some high-flying headline acts for a weekend event to commemorate the special anniversary. The Great War Display Team will take to the skies over Fareham in replica World War One aircraft and the Round Canopy Display Team will do a parachute display at the Solent Airport event. The World’s only wing walker display team, the AeroSuperBatics, will perform and a spitfire G-Spit will carry out a flypast before joining a P51 mustang for a static display during the special event on Saturday 8 June and Sunday 9 June. The Round Canopy Display Team will be at the event on Saturday, but all the other acts will perform on both days – and there’s more acts still to confirm, which Fareham Borough Council will announce in due course. Tickets go on sale on Monday 25 March and reflect the family-friendly focus of the event with a ticket option that includes unlimited free funfair rides and children’s activities. A family ticket (two adults, two children) bought in advance is £25 for one day or £40 for the weekend; adult tickets are £8 each day or £15 for both and all-inclusive children £8 for one day or £12 for both. Under 2s go free. Concessions and non-inclusive children’s tickets are also available. A total of 7,000 tickets will be available for each day with tickets expected to sell out fast, so people are advised to get them early. Aircraft is the focus of the event and Solent Airport at Daedalus is the perfect place to mark the occasion. It was the busiest airport in the UK on D-Day with more than 400 aircraft movements – the largest number from any UK airbase. Tickets can be bought in advance from Ferneham Hall, online and at the Control Tower at Solent Airport. Free parking permits can be requested when buying tickets and will be issued on a first-come first-served basis. Children’s activities will include a fun fair, face painting, craft activities, character walkabouts and a vintage car display. Arena events will include a display from the children’s motorcycle display Green Rockets team, historical re-enactments, marching bands and music from the D-Day era. To mark the event, a special D-Day memorial plaque will be unveiled by the Mayor of Fareham on Saturday 8 June. A range of market stalls and food and drink stalls will be at the event and families can also bring their own picnics and use designated seating areas. 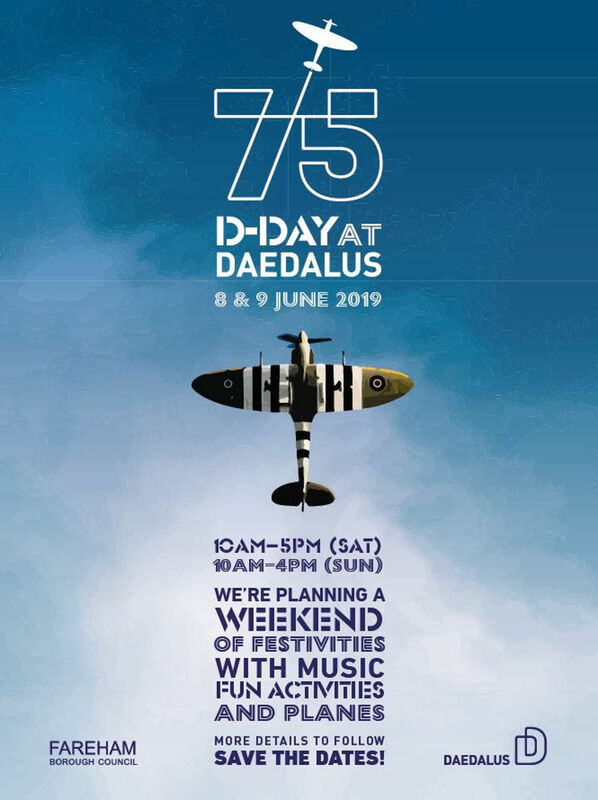 Chairman of the Daedalus Steering Group, Cllr Trevor Cartwright, said: “We are delighted to be able to announce such amazing headline acts for our special D-Day 75 event. The skies will be full of incredible aircraft and parachutes – it will be a real sight. “Tickets are now on sale and we’ve had so many enquiries that we’re expecting them to sell fast. We only have a limited number of tickets, so don’t delay in getting them.